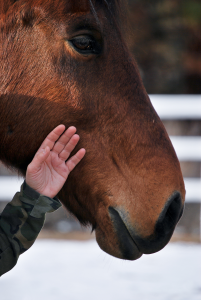 Healing Reins Therapeutic Riding Center is pleased to offer Equine Facilitated Psychotherapy (EFP), an experiential, “outside of four walls” therapy that involves equines as therapeutic learning partners. Used around the country, EFP is an efficient and effective means to provide mental health therapy. Because horses are prey animals, they are extremely sensitive, reflective, and intuitive beings and can function as large biofeedback machines, providing the client and the therapist with information regarding the client’s mood and changes within those moods. This feedback provides abundant self-awareness, learning and skill-building opportunities for both the client and the therapist. An EFP session does not include riding – rather it is a safe, confidential space for the client and therapist to engage in activities using learning with the horse to help process feelings, thoughts and reactions. People who can benefit from this form of counseling include those with mental and emotional health issues stemming from abuse, emotional and/or physical trauma, PTSD, grief, loss, personality disorders, addiction, anxiety, and depression. Assertiveness, emotional awareness, empathy, stress tolerance, flexibility, impulse control, problem-solving skills and independence are but a few of the outcomes that can be realized by participating in EFP counseling. Group, couple, family and one-on-one sessions are available and our goal is to offer all of our clients a positive outlet for metaphorical learning and a healthy, empowering relationship with horses. Please fill out the Mental Health Information form to the right so we can match you with the appropriate mental health professional.